After being knocked off the air by Hurricane Michael, talent from Panama City, Florida ABC affiliate WMBB appeared on air Thursday, Oct. 11, 2018, from a makeshift outdoor studio in the station’s parking lot. 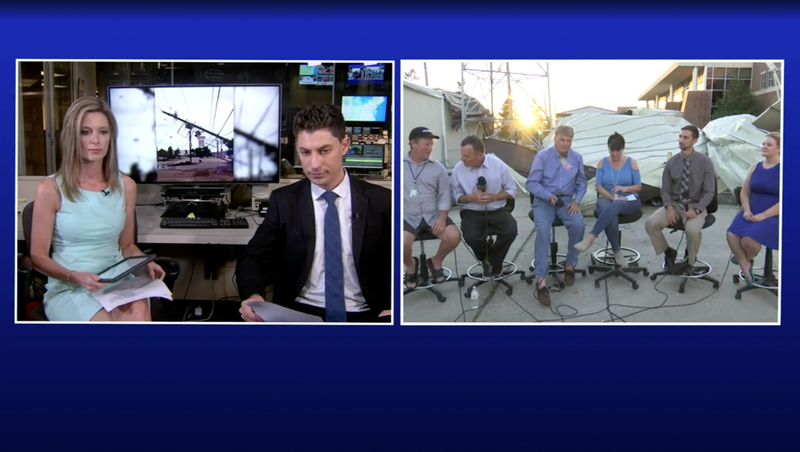 The Nexstar-owned station had been relying on its sister station WFLA in Tampa to broadcast online and on Facebook, but WMBB talent Chris Marchand, Justin Kiefer, Tom Lewis, Amy Hoyt, Ross Whitley and Sam Lucey anchored an hourlong newscast starting at 12:30 p.m. local time Thursday. Talent at WFLA in Tampa tossed to an hourlong live report from sister station WMBB in Panama City Thursday at 12:30 p.m. eastern. 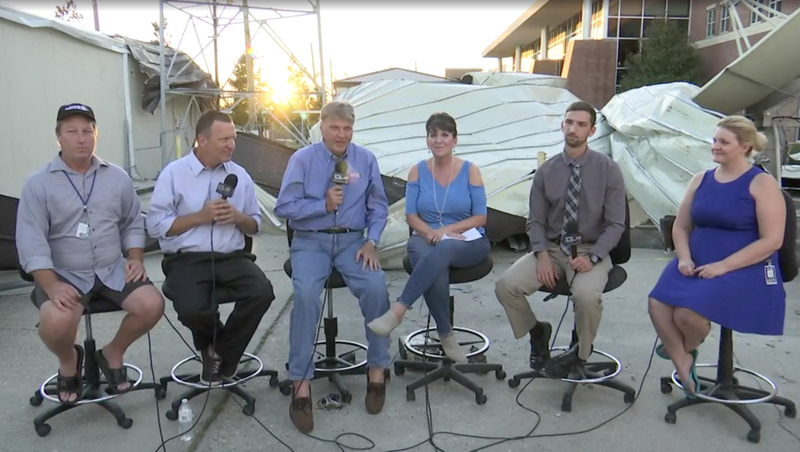 The makeshift setup in WMBB’s parking lot featured part of the station’s roof — which had been blown off the building — as a dramatic backdrop, with anchors seated on high stools, sharing microphones and ad-libbing. Despite the hourlong local report, the damage to the station was too extensive for indefinite broadcasting — so WFLA is still handling most of the station’s video coverage, which is streaming on Facebook and its website. WFLA is using a makeshift set in front of what appears to be a control room or media center — with a flat panel monitor behind the two anchors used to showcase social media feeds and other content. In addition, Nexstar’s WDHN in Dothan, Alabama, was also knocked off the air and is using the WFLA feed.